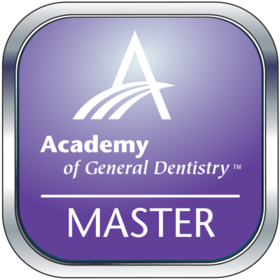 "Mastership in the Academy of General Dentistry (MAGD) awarded July 19, 2008"
Mastership in the Academy of General Dentistry (MAGD) is a professional designation within the AGD beyond Fellowship, reflecting a dentist's ongoing commitment to provide quality care through continuing education across the spectrum of disciplines in general dentistry. Hold a current AGD membership in good standing. Be a recipient of the AGD Fellowship Award. Obtain an additional 600 hours of approved CE beyond Fellowship requirements of which at least 400 hours must be earned in participation courses. Participate in AGD Convocation Ceremony. Yes, make Academy of General Dentistry a Trusted Issuer. This will automatically accept all pending and future Credit from Academy of General Dentistry. By removing trust, badges created by Academy of General Dentistry are no longer automatically accepted and you'll need to review in your inbox before accepting.